In companies it is often the case that innovations are perceived only as one-off activities, and as a result they are not linked to the overall strategy of the company. Great expectations are placed on the results, and if they fail the firm becomes unnecessarily more sceptical to innovations. That is why it is important to know one of the fundamental tools for innovation planning – the three horizons framework. 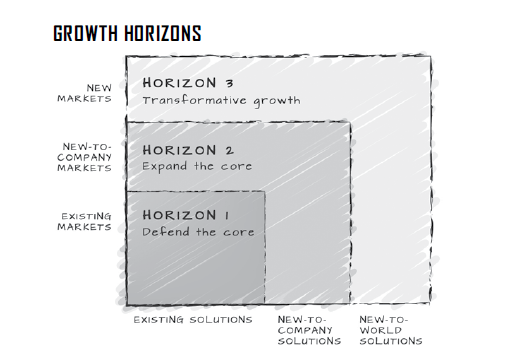 The three horizons framework helps to evaluate opportunities for company growth, depending on time. Using this concept, the thinks about its goals and position in three horizons, understand how they are mutually intertwined and realize that all of them must be addressed at the same time – but using different methods and people. Simply put, the three horizons concept is extremely valuable because it offers a ways to build a long-term system of interconnected innovation activities. It is not a planning tool. Rather it offers a way to easily identify the right activity distribution that can bring business transformation into virtually any company. First horizon category covers all improvements and adjustments ensuing from the core of the product or service that the company already offers and continues to develop. A good example is My Burger service, enabling customers to build their own meal in McDonald’s, or self-service checkouts using a scanner introduced by Globus. The majority of firms implements such innovations within one year. The investment risk is low and the ROI might be quite high. However, these innovations can lose their potential due to fast changing environment. Anyone can enter and disrupt the existing market order by offering a substantially better or cheaper solution. These kind of innovations might use sophisticated technologies but if it does not help to make a new product or reach new customers it is still categorized as horizon 1. The second horizon deals with innovations that fundamentally alter the company’s existing business. This means for example expanding the product portfolio, entering new markets, changing the business model or application of new technology with a potential to gain new customers. A good domestic example of this is the expansion of Tesco from retail to telecommunications and finance via Tesco Mobile and Tesco Financial Services, or the service Práce za rohem, which we have built for LMC. Horizon 2 innovations can bring premium results within two to three years from its implementation with a sensible degree of risk. However, it is essential for these innovations to be supported and taken into account in long-term strategy of the company. They require a longer-term commitment in order to succeed, despite the fact that they do not bring results in the next quarter. This is a riskier form of innovation, but it can bring huge improvements. These are innovations that target completely new markets, often with new technologies and not always with a clear link to the existing business. The goal of the third horizon is to investigate and develop alternatives that could replace the existing market or create a new one, but in a longer time frame. 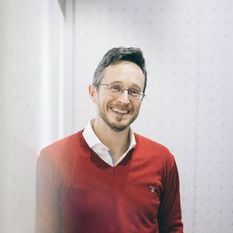 A good example here is the expansion of the manufacturing conglomerate 3M or the printing company YSoft activities into venture capital, with 3M Ventures and YSoft Ventures. Horizon 3 innovations often originate outside of the firm. They begin with potentially groundbreaking technologies and may take a form of investment in a company that is already working on innovations. The implementation of these projects usually takes from 3 to 7 years and carries a high degree of risk. In a nutshell, it is possible to say that the first horizon focuses on the firm’s present position and situation, and that these innovations are incremental. However, it does not mean that they are inferior – within the short term they can bring a lot of profit. In the second horizon the company attempts to achieve a more dramatic improvement via well managed experiments just beyond the boundaries of its existing business. The third horizon requires a visionary view of the entire company, technological trends, and placing the company within the context of these changes. It often requires the owner’s involvement and his/her investment mind. It is essential for companies to focus at least on horizons 1 and 2 in order to gain a long-term competitive advantage. Owners who are genuinely concerned with the long term will also devote themselves to horizon 3. It is important to keep in mind that all three horizons place different demands on staff. The first and second horizon require specialized teams focusing solely on the innovation projects. These are ideally external partners because attempting to implement the innovations internally might endanger the project results due to lack of experience with bringing the new ideas to the market. A dedicated external team can see and evaluate the company’s position from a different perspective. It helps to avoid tunnel vision and stereotypical methods that usually do not lead to good business approaches. At the same time, it helps to create an innovative environment that the company can then tap into in future projects. Be it internally or in cooperation with experts, by using the three horizons framework the company takes a huge step towards integrated and strategic innovation policy. Otherwise it risks being overtaken by competition or failing to integrate social and technological developments that can change or destroy the traditional business models.